NCSIMUL Machine is the most advanced CNC realistic machine simulation solution for simulating, verifying, optimizing, and reviewing machining programs based on the real characteristics of your CNC machine (turning, drilling, riveting). 3D graphics help to avoid machining crashes while powerful algorithms and embedded process-based know-how enable cutting conditions optimization, and standardization of the shop-floor documentation. 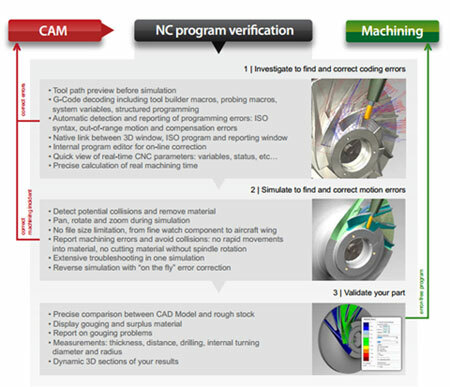 NCSIMUL Machine verifies CNC programs (g-code based) in three steps: investigates and corrects coding errors, simulates to locate collisions and correct motion errors, then validates the CNC program. Many customers report that this capability is also a helpful training tool for new employees since virtual learning sessions are short, easy to understand, and eliminate basic programming mistakes. NCSIMUL Machine is developed by SPRING Technologies. Based in France, it collaborates with manufacturers using 5 axis machines, complex machines (over 5 axis) in aerospace and defense, transportation, energy, industrial equipment and medical devices sectors worldwide. The following video introduces how NCSIMUL Machine is used in a variety of industries. Why do we need NCSIMUL Machine? Verifying g-code based programs directly on the machine is risky and decreases productivity. 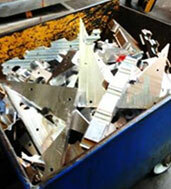 NCSIMUL Machine can detect problems which may happen during the machining process beforehand. By replacing the verification process from the real machine to NCSIMUL Machine, users avoid risks and gain productivity by using the machine only for producing products, hence reducing drastically prove-outs. 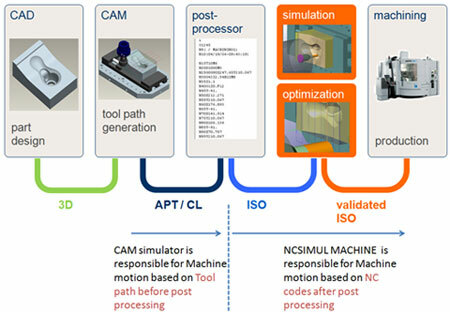 Why is NCSIMUL Machine better then CAM internal Simulator ? 1. CAM simulation can only simulate internal codes before post process (APT based). It means CAM simulation can’t simulate g-code based programs which the real machine is using. Therefore, we will not be able to know the result for sure. NCSIMUL Machine can simulate g-code based programs which are directly read by the real machine. Therefore, the simulation result is exactly the same as the real machine. The user can then push the start button with confidence. 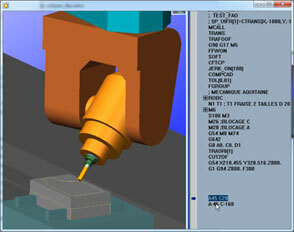 The user can check any CNC programs from any CAM into one system. The user can also check modified CNC codes after outputting from CAM. Most CAM internal simulators use a static collision detection algorithm. The collision checking is then done step by step, based on time and/or distance. NCSIMUL Machine can detect all collisions during simulation. 4. In some cases many axis of position can exist, so the CAM simulators choice could be different from the Post-Processor. Ex: Machine 5 axis with AC head, the position A45 C20 or A-45 C-160 can be used for the same position. NCSIMUL Machine can simulate the correct position. How to work with NCSIMUL Machine? “We tried to use our CAM software to prove-out our tool paths, but the results were nowhere near as reliable as when we directly simulate our g-codes with NCSIMUL Machine. We are happy to introduce and support NCSIMUL Machine in the Thailand market!! The turnover rate of Engineers in Thailand is very high and their skill level is very different. Companies need software which reliably checks their CNC programs to avoid risks and run machines with safe and secure CNC programs.